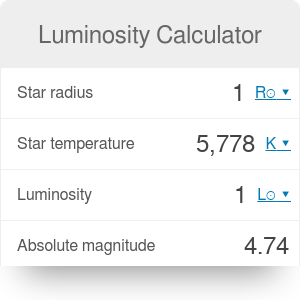 This luminosity calculator is a handy tool that allows you to calculate the energy emitted by stars, as well as how bright they appear to be when seen from Earth. Thanks to this calculator, you will also be able to determine the absolute and apparent magnitudes of stars. But that's not all - we will also provide you with a handy luminosity equation that will make comparing any two stars a piece of cake! Luminosity is a measure of the energy radiated by an object, for example a star or a galaxy. For the stars of the main sequence, luminosity is directly related to their temperature - the hotter a star is, the more luminous it is. On the other hand, cooler stars emit less energy - hence, it's more difficult to spot them in the night sky. T is the temperature of the body, expressed in Kelvins. T☉ is the temperature of the Sun, equal to 5778 K.
You can also use this tool as an absolute magnitude calculator. Absolute magnitude is a different way to measure the luminosity. Instead of expressing it in watts, it can be shown on a logarithmic scale. The lower the absolute magnitude, the more luminous the star is - some very bright stars can even have negative magnitudes! For example, the absolute magnitude of the Sun is equal to 4.74, and of Bellatrix to −2.78. L₀ is the zero-point luminosity, equal to 3.0128 * 10²⁸ W.
D is the distance between the star and Earth, measured in parsecs. The absolute magnitude is defined as the apparent magnitude of an object seen from the distance of 10 parsecs. It means that for D = 10 parsecs, the apparent and absolute magnitudes are equal in value. Let's analyze Sun with this luminosity calculator to investigate its absolute and apparent magnitude. Input the radius and temperature of the Sun into the calculator. The radius is equal to R☉ = 695700 km, and the temperature to T☉ = 5778 K.
The luminosity calculator will automatically find the luminosity of the Sun. It is equal to 3.828 * 10²⁶ W.
The apparent magnitude of the Sun is equal to -26.83. Luminosity Calculator can be embedded on your website to enrich the content you wrote and make it easier for your visitors to understand your message.